I read this collection in early November and then neglected to post a review because, from the first story, it had me so in the mood for more stories set in Colonial America. The first four of these "Nine Historical Romances [that] Grow Alongside a New Country"include two of my favorites from the collection. Set in 1750's and 1760's, introduce us to the four Ingersoll brothers of Connecticut and the women who capture their hearts. Each of these stories is followed by a related recipe. Another favorite is the fifth story, When the Shadow Falls, set near a British garrison in 1763. A French trapper's daughter and a private from the English fort challenge each others faith as well as their prejudices. The two New Garden stories (more favorites) reminded me of the 1950's film "Friendly Persuasion" and how interesting a Quaker story can be. Free Indeed tells the story of a former slave, Winkie, and the man her former owner's daughter arranges for her to meet. This was the least successful of the stories for me. The final story is the reason I originally requested this collection through NetGalley. 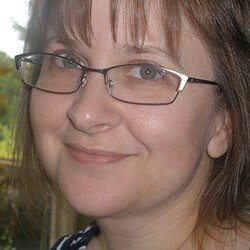 Having read Jane Kirkpatrick's The Memory Weaver (review here), I was eager to experience more of her writing. 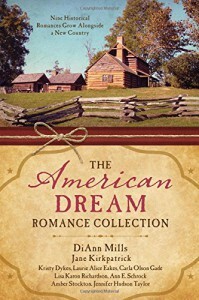 I was happy to find this was a story with a mature hero and heroine, a banker/lawyer who dreams of starting over in the Oregon Territory and a widowed midwife trying to raise a 16 year old and keep her farm going. This review refers to a review ebook copy read courtesy of the publisher, Barbour Books, through NetGalley, in exchange for an honest review.